Born 11th June 2009 out of Fareesha (Arabian) by Coblynau Cwmbran (Welsh Cob Canadian champion) A well grown mare with athletic ability and lovely temperament. Born 19th May 2010 out of Canterbrook Princess Royal (Welsh Cob) by Rainbow Blaze (Arabian). Currently standing at 15.3 hh, a forward going confident nature with potential for eventing type disciplines. Born 13th August 2012 out of Destiny (Welsh Cob) by Rainbow Blaze (Arabian). 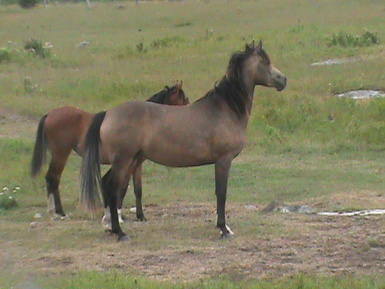 A lively, kind natured, bay coloured colt. Gelded 1st April 2013, should make 15.3 hh plus. Born 27th July 2012 out of Canterbrook Princess Royal (Welsh Cob) by Rainbow Blaze ( Arabian). A good natured cream coloured colt gelded 1st April 2013. Should make 15 hh plus. Born 25th April 2011, out of Destiny )Welsh Cob) By Rainbow Blaze (Arabian). A beautiful, confident filly, well grown with easy to do nature and great athletic potential. Currently standing at 15.1 hh. Born 7th August 2010, out of Trefrifawr Duchess (Welsh Cob) By Rainbow Blaze (Arabian). A lovely natured outcross filly with versatile potential. Currently standing at 14.3 hh. Born 31st May 2015, out of Trefrifawr Duchess (Welsh Cob), By Flint (Welsh Cob X Arabian). A beautiful and confident filly with lots of character and great all round potential. Born 10th April 2014 out of Destiny (Welsh Cob) By Rainbow Blaze (Arabian). A very sweet natured and confident gelding with great endurance potential. Born 16th May 2014, out of Canterbrook Royal Princess (Welsh Cob) by Rainbow Blaze (Arabian). A very pretty and sweet natured filly. Born 19th January 2014, out of Fortune (Welsh Cob X Arabian) By Rainbow Blaze (Arabian). A strong young gelded colt to make more than 15 hh, with potential for jumping, endurance etc. Full of character, extremely good natured. Born 21st March 2014, out of Trefrifawr Duchess (Welsh Cob) By Rainbow Blaze (Arabian). 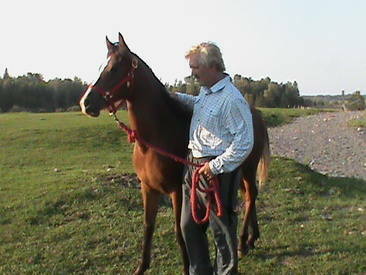 Copper is a beautiful red chestnut gelded colt, quiet and gentle nature with potential for endurance, hunter/hack etc. To make about 15 hh. Born 12th May 2010 out of Starlight (Welsh Cob) by Rainbow Blaze (Arabian). A sweet natured bay filly that likes to follow you around, easy to do with all the potential of the outcross. Currently standing at 14.3 HH. Born 20th April 2011 out of Starlight (Welsh Cob) by Rainbow Blaze (Arabian). A very pretty filly with sweet nature, has potential to be quite an athlete. A little more highly strung than some of the more easy to do ones but with gentle schooling will make a horse to be envied. Currently standing at 15 hh. Born 13th August 2011 out of Princess (Welsh Cob) by Rainbow Blaze (Arabian). A very pretty cream coloured filly interspersed with black in mane and tail, lovely sweet nature with athletic potential. Currently standing at 14.3 hh. Born 30th September 2011 out of Trefrifawr Duchess (Welsh Cob) by Rainbow Blaze (Arabian). A sweet natured filly, a little bit smaller than the others but very quick on her feet and athletic. Potential for barrel racing to endurance. Currently standing at 14.2 hh. A four year old sweet, gentle, very friendly natured Arabian X Canadian mare. A very nice addition to our trail riding business when mature. Currently standing at 14 hh. 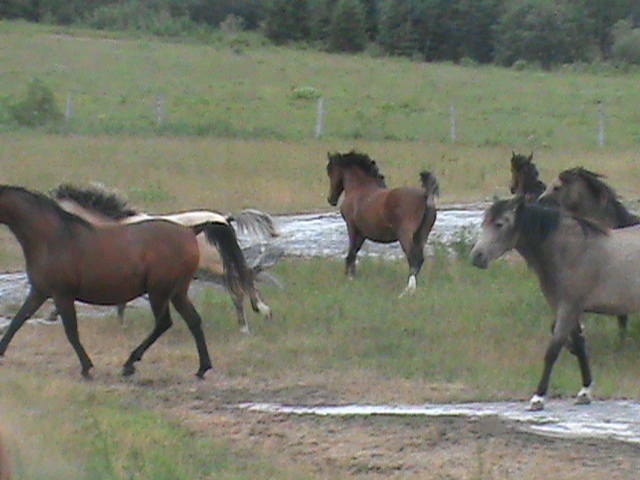 This picture was taken of some of the horses in the pasture. Having a large area to roam, run and play in a herd environment, helps in the horse’s development, physically and socially, learning skills that can be used in their training, using the natural horsemanship approach. Also it’s a constant blessing to be able to look out of your house windows and observe them. Why Welsh Cob X Arabian? The crossing of native breeds with the Arabian has for centuries proved to be very successful producing exceptional sports horses. In particular the thoroughbred, and from them the warm blood event horses etc. Whereas the Arabian is a perfect athlete in itself, it does have a few characteristics that can be a drawback, such as its length of stride (due to a short back with less vertebrae), height, physical strength and sometimes temperament. The Welsh Cob Section D adds improvement by increasing the stride length, physical strength, and stronger legs, while perfecting temperament. 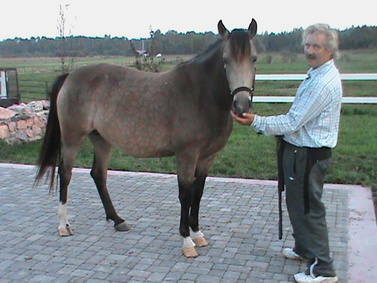 It has been proven through horses like ‘Eclipse’, that the cardiovascular system unique to the Arabians and its athletic ability is passed on to its offspring even in outcrosses with native breeds, thus producing quality sports horses.